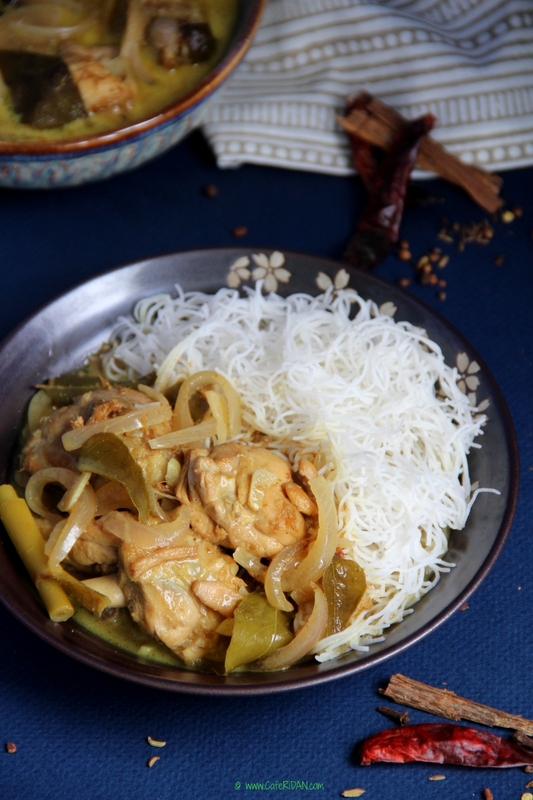 This simple homemade Sri Lankan chicken curry is light, flavorful and really easy to put together. My granny grew up in Sri Lanka and this is one of her recipes. Every year when we went to granny’s house for our summer vacations she always cooked us delicious a Sri Lankan meal. The food was always flavorful, spicy and finger licking good! For this recipe the spices are roasted to bring out their flavors and then ground into a powder. The dry red Chilies are roasted separately and then ground with a little water to make a paste. If you like heat then be sure to add more red chilis. They definitely do that in Sri Lanka! Another thing I do differently is frying the chicken lightly before adding it to the curry. 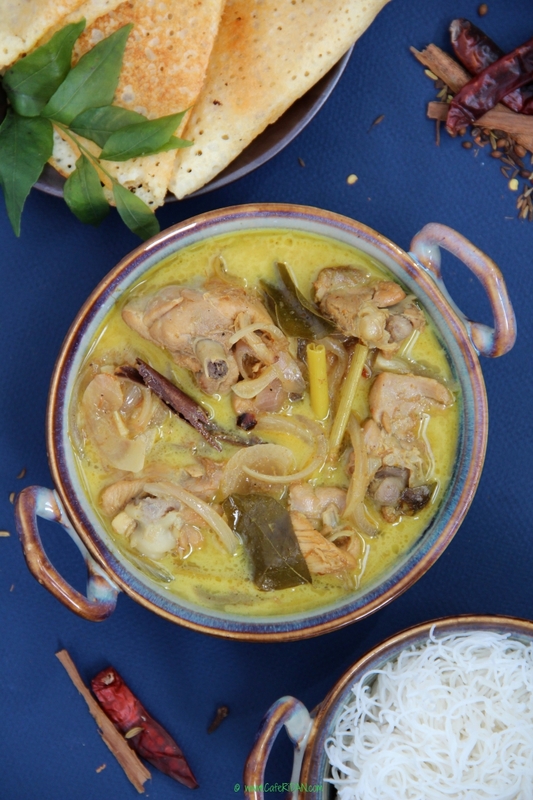 Sri lankans usually just add the chicken raw to the coconut milk and cook it. Make sure the chicken is bone-in and cut into really small pieces. 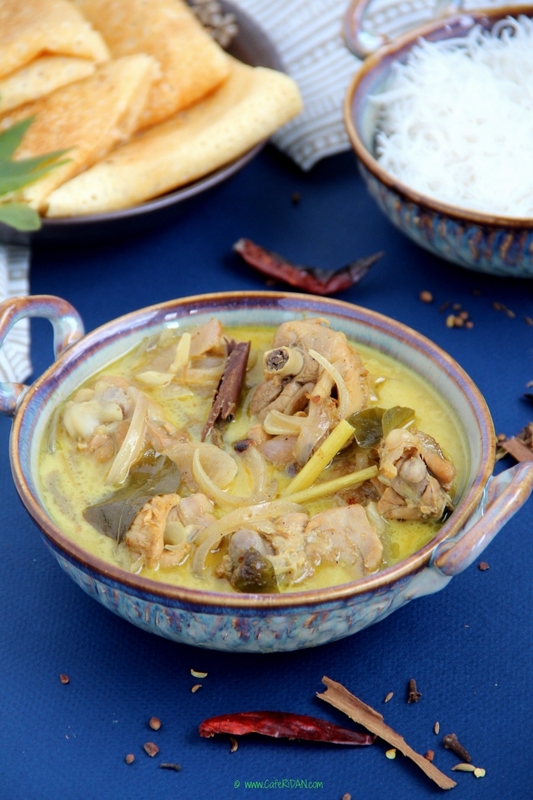 This curry is typically served with string hopper or appams but rice and dosas work just fine too. Granny always serves this curry with Seeni Sambal (a spicy onion relish) on the side. In a dry roast pan roast the fenugreek seeds, coriander seeds, cumin seeds and small cumin seeds for 1-2 minutes until light aroma arises. Cool and grind into a powder. Set aside. In the same pan roast the whole red chilies for 1-2 minutes until light aroma arises. Cool and grind into a paste with a couple tablespoons of water. Set aside. Heat oil in a deep pan. Fry the chicken until lightly brown and set aside. To the same pan add the coconut milk, water and all the ingredients except the chicken. Bring it to a boil and simmer for 10 mins. Add the chicken & simmer for another 10 minutes or until the chicken in cooked. Serve hot with dosas, string hoppers, appams or steamed rice.